Ward's gold is the first for the U.S. since David Reid in 1996. For the second straight Games, American boxers took a beating in Athens. 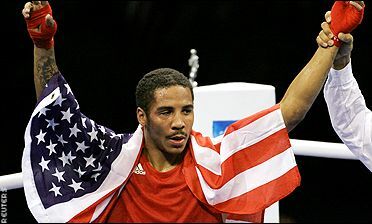 But Andre Ward claimed a bit of redemption Sunday, winning gold after coming from behind in his light heavyweight bout. Andre Dirrell won bronze. Vicente Escobedo became the fourth U.S. fighter to be eliminated from the Olympics on Friday. Andre Ward is through to the quarters, but welterweight Vanes Martirosyan was eliminated Thursday. Moments after the American boxing team's winning streak ended, Devin Vargas started a new one. Vicente Escobedo's punishing 30-10 victory over Colombia's Jose David Mosquera on Monday kept the United States unbeaten in the preliminary round. Vanes Martirosyan erased any doubts about the legitimacy of his spot in Athens, battering Algeria's Benamar Meskine in a 45-20 victory in the preliminaries Sunday. Middleweight Andre Dirrell got the U.S. boxing team off to a strong start Saturday, beating China's Ha Dabateer 25-18. Middleweight Andre Dirrell will meet China's Ha Dabateer in the second match of the Olympic boxing tournament, according to the draw announced Friday. Ron Siler and Rau'Shee Warren bonded in a Cincinnati gym and are now bound for the Athens Olympics. Boxer Vanes Martirosyan, an Armenian immigrant, is eager to pay back the United States by winning Olympic gold. The U.S. Olympic boxing team is ready for Athens, but who will we be watching five years from now?